Song titles are found hidden within common phrases. Each song title is a first name suggesting this is the person the singer is breaking up with. 23a [Force to be reckoned with (Barry Manilow, 1974)] HUMAN DYNAMO. Oh entry, you came and you gave without taking. 37a [Comfortable computer accessory (Toni Basil, 1982)] ERGONOMIC KEYBOARD. Oh entry, you’re so fine. You’re so fine you blow my mind! 66a [Deli loaf (The Four Seasons, 1962)] KOSHER RYE. Entry, won’t you come out tonight? 94a [Longtime Big Apple mayor (The Kinks, 1970)] FIORELLO LA GUARDIA. Well I’m not dumb but I can’t understand why the inside’s a woman but outside’s a man. 109a [Observable area (Dionne Warwick, 1967)] VISUAL FIELD. I…got nothin’ with this one. Never heard of it. 16d [Inadvertently mentions something upsetting (Starship, 1985)] HITS A RAW NERVE. I’ll never find another grid like you! 54d [Personal protector (Paul Anka, 1957)] GUARDIAN ANGEL. Oh-oh, oh-oh, oh-oh, oh-oh, oh-oh, oh-oh-oh. I enjoyed the heck out of this theme. The entries are all strong and I knew (or at least heard of) all but one of the songs. Sure, not all the songs are actual breakup songs, but that’s beside the point. The names are broken up, and that’s all that matters. And I’m still in awe about ERGONOMIC KEYBOARD and FIORELLO LA GUARDIA both hiding song titles and being the same length. That’s serendipity at its finest. Another nice touch, and maybe it’s coincidental, but 74a DON AMECHE hides NAME inside. ALBEDO (88a, [Planetary reflectivity measure]). Science! Never came across this word (that I can recall) in any of my science classes. PGH (1d, [Western PA city, to locals]). I had to look up that this is in fact Pittsburgh. O-CEDAR (67a, [Broom brand]). Not familiar with this brand. ANGOSTURA (106a, [Bark used for bitters]) crossing URI (108d, [Canton that shares a border with 35-Down)]. Despite its crosswordese history, I had forgotten that it was URI not ERI. TAMARA (105a, [Taylor of “Bones”]) crossing SINALOA (91d, [Mexican state with a major drug cartel]). I tried an I at that crossing because TAMARI sounded right to me for some reason. There may be others since there seemed to be a high number of proper names in the grid. There are plenty of highlights in the grid, though: LEITMOTIF (25a, [Recurring theme]), LULLABY, LANCER (my high school mascot), NARCOTIC (as an entry, not as a thing), the aforementioned Mr. Ameche, the [Multicolored play area] and germ factory BALL PIT, KIMONOS, and BLOCK ICE. With those goodies in the grid and a theme that I thoroughly enjoyed, I can easily look past the stuff that tripped me up. Four stars from me. Average-ish Saturday solving time for me, no harder than usual despite a number of entries that felt a bit off or unfamiliar—the central trio of SCULPTED ABS, DESSERT CASE, and TORCH RELAYS; plus “WHAT A LOSER,” IN AREA, UDON NOODLE, I-BANKS, C SCALE, TWO-TONE CAR, and TEA EGG. I’m not saying these aren’t legit entries, just that they had a weird vibe for me. Pander to my profession: 11a. [Get in the last word? ], EDIT. 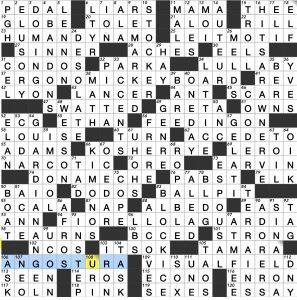 I used to be a medical editor, but switched over to crossword editing about 7 years ago. Living the dream, people. My pick for grossest row: 28a. [Lid bump], STYE / 29a. [Taking a stab at? ], BAYONETING. 57a. [Best Play and Best Moment], ESPY AWARDS. Tell me the truth: Did you want these to be theater awards rather than sports? 30d. [Competitors of Grand Ams], ALEROS. 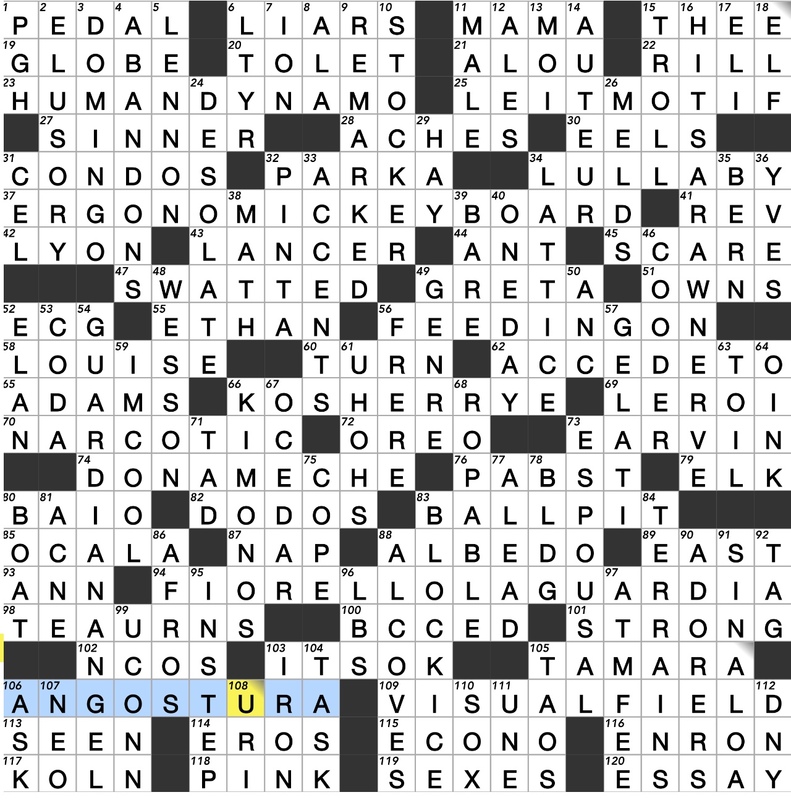 Except that Pontiacs and Oldsmobiles were both GM cars, and the Alero “shared its chassis and many parts, including engines, with the Pontiac Grand Am.” And except that nobody (except perhaps those who actually bought an Alero) is excited to see ALEROS in a crossword. 45d. [Sound barrier? ], REEF. Sound as in the body of water, I guess? 47d. [Actress Headey of “Game of Thrones”], LENA. GoT‘s final season starts in April. Are you ready? We left off with a big ice wall and some dragon drama. Easy peasy today. Solved in under 5 minutes. And this grid only has 66 words in it! This layout is slightly odd in that there are not many long answers, but the grid is still quite wide open. And with there not being many longer answers, the puzzle usually becomes a lot easier. Greg Johnson’s puzzles are slowly becoming easier and easier for me. A solid 4.5 stars for this one. 6A [Site with a Pill Identification Tool] – WEB MD – This site can be helpful, especially if you find unlabeled pills somewhere. 21A [Conversation on the go] – WALK AND TALK – I don’t often use this phrase (OK: I NEVER use this phrase! ), but still not too hard to get. 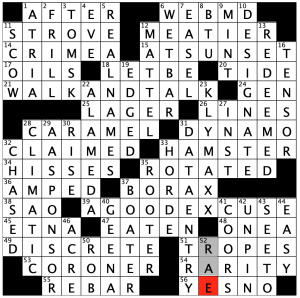 26A [Waiters stand in them] – LINES – Possibly the best clue in the puzzle. Simple, yet tricky! 3D [Siberian industrial center] – TOMSK – I have heard of OMSK, but not TOMSK. And I am not going there any time soon to investigate. 5D [What John Wayne and Cary Grant weren’t] – REAL NAMES – Another good clue. Most everyone knows this, but it is often forgotten. Marion Morrison is John Wayne, while Cary Grant was born as Archibald Leach. 9D [Flavor that pairs well with chocolate] – MINT – Especially well in ice cream! 22D [Bay Area city] – ALAMEDA – This came up in a Saturday puzzle last week, I think. This is not only a county name but a Bay Area city. 31D [Requirement for statistical analysis] – DATA ENTRY – This is what I do for parts of the day. it’s what we accountants do! 40D [Davis with a recurring role on “Grey’s Anatomy”] – GEENA – I don’t watch this show, and I had no idea. And I am not catching up 15 years at this point. 41D [Denver’s __ Field] – COORS – Balls fly out of here because of the thin air. I drove by here once, but I have never seen a game there. It’s on my bucket list! We will stop there. Enjoy your weekend! Definitely stumped today. I suppose I wasn’t in a big rush while solving this, meaning I didn’t necessarily speed solve this one, but I still was trying my darndest. I am going to fall back on the work-is-killing-me excuse, since it has been a horrific week or two and my brain is fried. Certain items I KNOW I know (38A [New York NASCAR venue] WATKINS GLEN) I just couldn’t come up with in a timely manner. Then when I did get it, I was just slapping my head in frustration. Still an excellent puzzle. I want difficult for these Stumpers, and I was not disappointed. For this 70-worder, 4.4 stars. 1A [”Busted!”] – “THE JIG IS UP!” – A great 1-Across entry. 23A [”World Beaters” producer] – ESPN – I am an ESPN nerd and I don’t recognize this! 41A [Fort McHenry National Monument and Historic __] – SHRINE – I tried MUSEUM. And I have been to this place! 3D [Illinois ”Watch City”] – ELGIN – Elgin watches are made there. I guess they don’t make smartwatches nowadays, so that’s why I don’t know the name! Even though this is not far from home for me. 4D [No longer wobbling, say] – JELLED – Why do I see this as GELLED instead? 12D [Very remote] – COLD AS ICE – Oh, THAT kind of remote! 23D [Legendary ”Grail Maiden”] – ELAINE – I have never heard of her. Where have I been? 31D [Where Theodore Roosevelt Jr. led troops] – UTAH BEACH – I didn’t know he fought at D-Day either. I need to read more! 43D [Gorilla safari locale] – RWANDA – This sounds like a ton of fun. Road trip! 49D [Oslo Accords participant] – PERES – I had PARIS in here at first. I was young when this happened (1993) and didn’t watch the news back then! It is still very much winter here. Brrrr! THEME: Antigrams- A word, when anagrammed, results in the opposite of the original meaning. 20A [Inapt anagram of “protectionism”] NICE TO IMPORTS. 33A [Inapt anagram of “evangelist”] EVIL’S AGENT. Well, I guess this depends on who you ask as well as the moral integrity of the evangelist in question. Sometimes, this “antigram” may be very apt! 39A [Inapt anagram of “antagonist”] NOT AGAINST. 54A [Inapt anagram of “commendations”] AIMS TO CONDEMN. These were a lot of fun to uncover for the most part. Especially NOT AGAINST and (my favorite) EVIL’S AGENT. I admit I struggled to understand NICE TO IMPORTS. For the longest time, I thought it was referring to imports from a city called NICETO (perhaps in Argentina?). But that seemed too obscure/specific. Rather it means the quality of being NICE TO IMPORTS. Still feels a bit weird. A good time was had overall. You can find a bunch of these here (“A Volunteer Fireman” = “I Never Run to a Flame” Hahaha!). 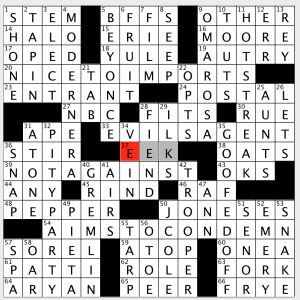 From my cursory search, I only noticed EVANGELIST/EVIL’S AGENT listed from this puzzle. Well done, Trent! 4 stars. This entry was posted in Daily Puzzles and tagged Frank Longo, Greg Johnson, Ryan McCarty, Todd Gross, Trent H. Evans. Bookmark the permalink. Universal – Dave, I accidentally clicked on 3. I meant to give it a 5. Could you please change my rating. The puzzle was outstanding. UDON NOODLE saved me in the bottom, thought it also was not obvious for a while. But I’m grateful for TEA EGG. I’ve never made one, but I will today. All in all, a good Saturday workout. NYT: There might be more excitement about ALEROS if they were TWO TONED CARs. Which are making a comeback. Apparently. A good NYT, I found the central block of the puzzle was somewhat harder than the outer edge. 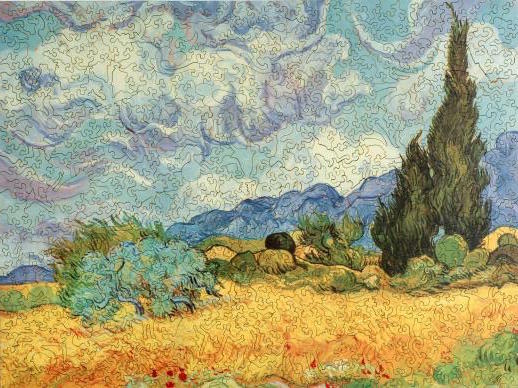 I was stopped for a while by CYPRESS– I think of cypresses as denizens of semi-tropical swamps, rather than the French countryside. Evángelos Odysséas Papathanassíou aka Vangelis. Admittedly, it comes across as a soporific science class lecture. I know of the film (Oscar-winner, I believe). I’ve never seen it and I didn’t know the song was connected to it. Thanks for the heads-up. Interesting. Didn’t find the entries you focused on as “off” as you did, Amy. For me this was a really good Saturday. SCULPTED ABS, DESSERT CASE, and TORCH RELAYS all felt solidly in the language and not contrived, ditto C-SCALE and I-BANKS. Stumper: 8d [Haunts] STOMPING GROUNDS. I definitely stick to stamping grounds but before anyone champs at the bit I concede that the spelling in the puzzle is also valid. Ngrams for your convenience: this and this. 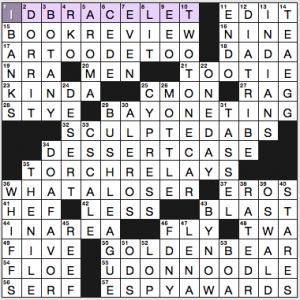 Fun puzzle for me of about average Saturday difficulty. The ESPY Best Moment award has sometimes been about great athletic feats (Pete Sampras winning the US Open as a 17 seed in 2002, beating Agassi), sometimes about teams finally winning-the Cubs, the Cavaliers), but also sometimes about real legitimate accomplishments that tear at your heartstrings–my favorite being the autistic high school senior from Greece New York who as more hardworking ballboy than player had never been in a game, but out of respect for his hard work and enthusiasm was inserted in the final quarter of the team’s final home game where he shot an airball and missed a layup, then made a 2 point shot and six three pointers in the last four minutes of the game. Needless to say, the crowd went wild and there were not many dry eyes that night. Thank you Steve. It’s a wonderful moment and it brought tears to my eyes. 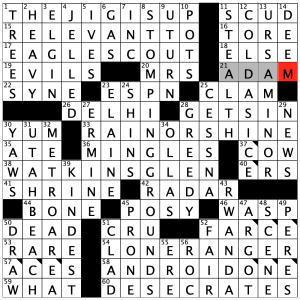 NYT: The puzzle lost me at ARTOO DETOO. That’s just wrong and there’s no coming back from that when you’ve made it a key component of your grid. NW and SE were easy enough, but I struggled to finish the rest — TWOTONECAR? What now?MOTTLE as a noun is weird, CSCALE took forever to see, and I don’t see how TORCHRELAYS count as preparation for Olympics. Never heard of IBANKS (and don’t know what it means) or TEAEGG but the crosses took care of them. Also: “Orange ball” = FIVE? Can someone explain, please? On a pool table, the five-ball is solid orange. Thanks. I had FIRE for a while, out of desperation. This was such a slog, BAYONETING I didn’t see until the first letter finally dropped. That whole middle section just crawled for me. I didn’t care for the clue/entry. It made me think of a house slave. The LAT was fun and super easy today, not just because I live in [Bay Area city] ALAMEDA! WSJ, seems to me square 61 could just as well be “O”. Stumper gave me a workout.